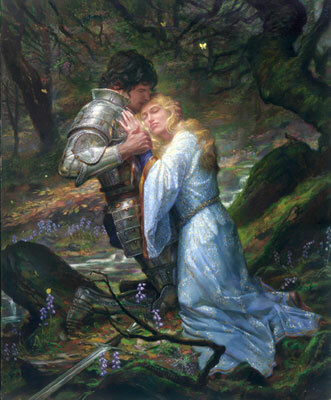 The love of Guinevere and Lancelot is one of the most famous and certainly the most romantic tale of Camelot. One evening King Arthur and his knights were sitting at the Round Table. The Lady of the Lake that gave him Excalibur walked up with three young men. One of them knelt at Arthur's feet:"This is Lancelot. I have trained him for many years at the castle in my lake. It's Merlin's request that you bestow upon Lancelot his knighthood". After Lancelot was knighted, he quickly became one of the Arthur's most trusted and bravest knights. However, he kept a dark secret for many years. He and Arthur's wife, Queen Guinevere, had fallen in love from the first time they saw each other. Lancelot was troubled by his love because he had pledges loyalty to king Arthur, but in his heart he made a separate pledge. He would serve Guinevere in everything from that day on. Lancelot's and Guinevere's love for each other caused them great pain because they were also devoted to Arthur, and did not want to betray his trust. In the end, their love was found out and as Queen Guinevere was about to be tried for treason, Sir Lancelot gathered many knights to rescue her. He rode in, and swooped her onto his horse and rode away leaving many dead behind him, leaving Camelot was divided and in turmoil. Their affair is exposed by the knights Agravain and Mordred, and Lancelot fled for his life while Arthur reluctantly sentenced his queen to burn at the stake. Knowing Lancelot and his family will try to stop the execution, Arthur sent many of his knights to defend the pyre, though Gawain refused to participate. Lancelot arrived and rescued the queen, and in the course of the battle Gawain's brothers Gaheris and Gareth are killed, sending Gawain into a rage so great that he pressured Arthur into war with Lancelot. When Arthur goes to France to fight Lancelot, he leaves Guinevere in the care of Mordred, who plots to marry the queen himself and take Arthur's throne. She hides in the Tower of London and then takes refuge in a convent to escape Mordred. Hearing of the treachery, Arthur returns to Britain and slays Mordred at Camlann, but his wounds are so severe that he is taken to the isle of Avalon. Guinevere meets Lancelot one last time, then returns to the convent where she spends the remainder of her life.